Last week in Springfield, the IHHA testified again to the importance of reinvigorating Illinois horse racing by permitting us to compete with other states that allow “racinos.” The bill that allows slot machines at the racetracks has been agreed upon by the horse racing industry and is ready to go, however, this new conversation concerning sports betting is a new wrinkle and one the state is looking at closely. It is important that we remain relevant to the General Assembly by continuing to stay “front and center”. Our testimony was well-received, as they continue to hear us loud and clear. We submitted this letter specifically in regards to sports betting. We continue to work closely with the thoroughbred horsemen’s association from upstate and downstate. The Illinois elections are right around the corner and we encourage everyone to get out and vote. Once this election is decided, things will begin to take shape and legislators should be able to start working again to fix all of Illinois’s problems. We plan on being part of that solution. Stay tuned. A bevy of ICF Standardbreds will invade Hoosier Park tonight with the hopes of boosting their purse earnings in open company stake races. A half-dozen 3-year-olds, headed by a trio of Hawthorne’s Night of Champion winners, will go postward in divisions of the Circle City stakes while the 2-year-old Maximus races in a $66,400 division of the Madison for juvenile pacing colts and geldings. The Ken Rucker trainee is making his first start since he was nosed-out on the Night of Champions by Meyer On Ice in the $136,142 Incredible Finale final. All three Night of Champion victors drew very well in their respective events. Robert F. Carey champ Fox Valley Gemini (Casey Leonard) landed the pole position in the third race first $42,650 Circle City split for sophomore male pacers and is listed as the 3-1 second favorite in their morning line. Fox Valley Gemini tested the Indiana seven-eighths oval two weeks ago and came away with a 1:50.3 victory, pacing a rapid 26.2 last quarter. Fox Valley Gemini will bring a flashy season record of 10 wins in 12 outings. Currently under the care of trainer Ross Leonard, the son of Yankee Skyscraper has $295,000 in earnings in his first two campaigns of racing for owner Jim Ballinger of Atwater, Illinois. The New Americana also drew the rail in the fourth race first Circle City division for pacing colts and geldings and will be driven tonight by Brandon Bates. The Plum Peachy champion had some bad racing luck a week ago when she finished sixth in a division of a Pegasus stake. The Misael Garcia trained filly was third on the inside much of the way but got shuffled back in the lane and found racing much too late, beaten three lengths. Beulah Dygert titleholder Trotting Grace saw her five race winning streak snapped last Friday when she was third in her Pegasus stake division. The Steve Searle trotting filly cut a fast pace of 27.4 and 56.3 to the half before she tired in the last 20 yards or so. Trotting Grace (Trace Tetrick) shot out of the gate and got an easy lead but the layoff and the fast sub 28 first panel proved to be detrimental. Nevertheless trainer Steve Searle, who shares ownership of Trotting Grace with Mystical Marker Farms (Valparaiso, Indiana) and Bill Wright of Morton, Illinois, was pleased with his filly’s performance. “She raced well,” said Steve. “It was her first start since the Night of Champions, four weeks earlier so even though she was sharp, she wasn’t razor sharp. Trace Tetrick will be back at Trotting Grace’s lines when she leaves from post three in the 12th race third Circle City filly trot division. Allbeastnobeauty, winner of the Springfield final for 3-year-old ICF pacing fillies and the Time Dancer at Du Quoin, debuts for new connections when she leaves from the outside eight slot in the fifth race second $37,250 Circle City filly pace. She was acquired by trainer Virgil Morgan nine days ago and will be driven tonight by Corey Callahan. Springfield champion Illinimight will have regular driver Casey Leonard in the bike for the ninth race second $48,500 split for trotting colts and geldings. The Cassis trotter with $53,976 on his 2018 card will race out of the barn of trainer Shane Bowermaster tonight. The Tom Simmons stable’s Backstreet Lawyer (Mike Oosting) has his work cut out with the seven-post in the eleventh race nine-horse second division of the sophomore male pace. The Sagebrush gelding has been the victim of some unfortunate trips in both of his Indiana starts. First post at Hoosier Park is 6 pm Chicago time. There comes a time when you realize you can’t do something as well as you did earlier in life. For Illinois Harness Hall of Fame driver Jerry Graham that realization came 11 years ago. “The last time I drove at horse was at the Altamont Fair in 2007. There was a wreck that knocked me 15 feet in the air,” said the 77-yar-old Graham who was 66 when a two-year-old horse he was driving went down and sent Jerry airborne. A few years earlier at Fairmount Park Graham and the horse he was taking out to the racetrack were literally run over by a water truck. Smashing Don (Jerry Graham) was still going strong at the age of nine. Here’s a 1977 photo of the pacer winning a Sportsman’s Park Invite before a crowd of 16,886. That’s Pacing Boy (No. 2 Del Pletcher) behind him. Not pictured is the runner-up Misty Raquel, driven by Jerry’s brother Tom Graham. (Pete Luongo Photo). Graham began driving horses with his father and brothers as a 12-year-old and started competing at race tracks when he was 17. USTA statistics show Jerry with 1,421 dash winners however since its Pathway records don’t begin until 1977, Jerry’s total lifetime winning drives is likely much greater. In 1976 Graham had 76 wins at Sportsman’s, in 1975 he made the Top Five with 35, a year earlier his 37 winners were second best to Joe Marsh Jr. in just the Chicago Downs portion of Sportsman’s summer meeting (there was also a Fox Valley Club meet those days at the Cicero, IL facility) . Graham also was driving at racetracks such as Maywood, Fairmount, and both the Illinois state fairs meets at that time. The Salem, Illinois native drove many of the family’s star horses on the Chicago circuit in the 1970’s and 80s’, such as Tarport Hap, Misty Raquel, Smashing Don, Misty Misty and Rusty Knight, just to mention a few. Graham does have a favorite. In the mid-70’s Smashing Don was battling the likes of Rambling Willie, Pacing Boy, Why Bill, Gay Skipper, Taurus Bomber, Rin Tin Tim among many other top-notch pacers. From 1975 through 1978, racing as a 7, 8, 9 and 10-year-old Smashing Don still knew how to find the winner’s circle and rake in the dough. The gelding notched nine season victories in 3 of those 4 years and had eight in the other and those 35 wins came in 125 starts against the best horses on the grounds. The winner of $504,532 in career earnings did it the hard way with no six-figure sake victories. And a interesting note is that Smashing Don wasn’t meant to be a pacer. He was trotting bred. 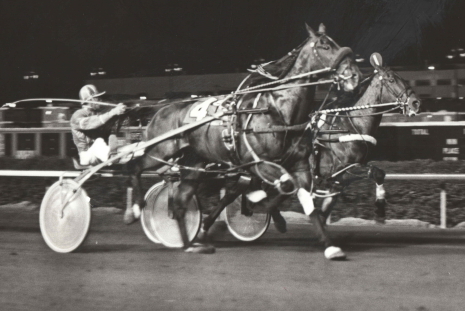 His sire is Florican, a National Immortal Half of Fame inductee (1976), and his dam Mighty Phyllis was by Scott Frost, the Trotter of the Year in 1955 and 1956 and another Hall of Fame Immortal. After his driving and training days were over, Graham settled in as a successful Illinois breeder and owner. Not too many years ago Jerry had 35 broodmares on the Graham farm in Southern Illinois. However that number has currently dwindled to just a few. Fox Valley Poetry gave us such Illinois trotting standouts as Powerful Charger, Macie Rae, Powerful Poe, Powerful Father and Powerful Poet. 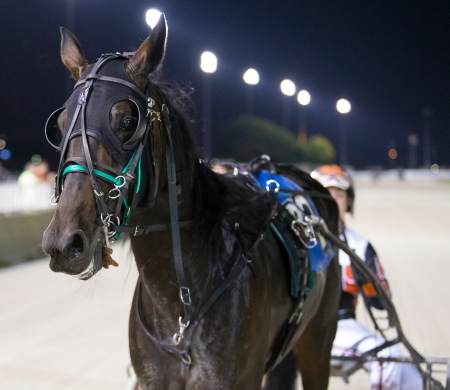 Graham also had the former Illinois Trotting Sire of the Year (2013) Powerful Emotion. 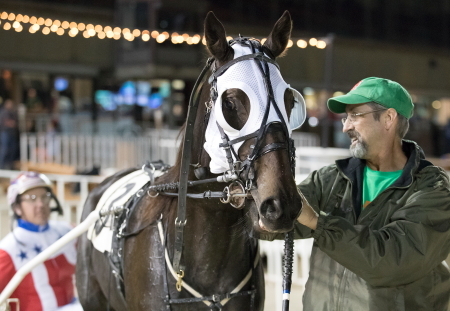 His sons or daughters include the 2013 Illinois Harness Horse of the Year King Mufasa, as well as Sara The Spy, Master of Excuses, Anthonyskywalker, and the “Powerful” trotters ‘Charger’, ‘Speed’, ‘Poe’, ‘Star’ and ‘Yield’. “Powerful Emotion is gone too,” said Graham. “I sold him at Delaware (Ohio) a couple of years ago. Hoosier Stake Lures ICF Trio: Three Illinois bred sophomore horses will be competing (Friday) tonight in divisions of the Pegasus stakes at Hoosier Park. Trotting Grace, a Beulah Dygert stakes winner on Hawthorne’s Night of Champions for trainer Steve Searle, goes in the second race $26,800 first 3-year-old filly trot division while the Mike Brink Stable’s Maui Mama (Mike Oosting) is a starter in the fourth race second split. The New Americana, now under the care of trainer Misael Garcia, will go postward in the third race $34,050 Pegasus for open company 3-year-old pacing fillies. Casey Leonard will take over the lines tonight on the Night of Champions Plum Peachy victor. On Wednesday, October 17th, a hearing on sports betting will be held at the Capital in Springfield. Horsemen have submitted the letter below and will be ready to testify if called upon. Last month, a hearing was held on SB7, the larger gaming bill, which included slots at racetracks. We also, submitted a letter at that time and testified to the critical importance of allowing horseracing to compete with other states. We anticipate that discussions on the expansion of gambling will be a hot topic in the coming months. The IHHA, the ITHA and the ITBOF, will work together to stay relevant in this process, by promoting our agenda of rebuilding Illinois horseracing in the state. Let’s look back eleven years to 2007. It was a much different harness racing schedule in Illinois and while Hawthorne hosted its Night of Champions their showcase event came a lot earlier in the season and its live racing schedule was only about a third as long as this year’s. Both Balmoral and Maywood also had split harness racing meets. Each started at the beginning of the year and went through mid-June and then started up again in early August through the end of the year. In between Hawthorne conducted a 6 and 1/2 week meet (39 days) with a Tuesday through Sunday format. The three Chicago circuit tracks raced a total of 316 nights in 2007 compared to just a 71-night Hawthorne meet in 2019. Hawthorne did make the most of its race dates in 2007 with an ambitious stakes schedule put together by its Racing Secretary Billy Perkins. Unlike now days, the $82,000 Erwin F. Dygert was an open trot stake. 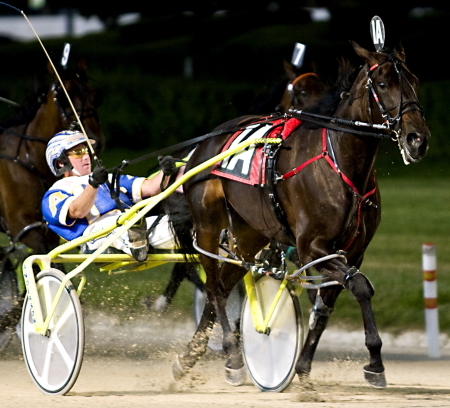 In 2007 it was raced on July 21 and won by the Joe Anderson Stable’s Two Weeks Notice and driven by Dave Magee. On its first Saturday program Hawthorne hosted a pair of $60,000-plus 3-year-old Open stakes, the $61,000 Lady Chicago for filly pacers and the $68,000 Chicago for pacing colts and geldings. Cabana Fever, trained by Joe Seekman and driven by Dave Magee took the Miss Chicago by a neck of the Homer Hochstetler Stable’s Sportsfancy while the Ken Rucker trained entry of Johnny Charisma (Mike Oosting (and Exterminator (Todd Warren0 were the one-two finishers in the Chicago stake. Eleven years ago there were only eight ICF finals on the Night of Champions compared op the current 11. There were no NOC events for older ICF pacers or trotters. With a short meet two NOC stake series legs determined the 2007 NOC finals. The ninth stake on the Night of Champions was the Robert F. Carey Memorial for open company pacers. The nine Night of Champions stakes in 2007 offered $575,000 in purse money (Compared to this year’s $1.1 million) with the $92,000 Carey by far the richest pot of the evening. The then 4-year-old ICF pacer Thisbigdogwilfight (Dave Magee) won the fifth renewal of the Carey in 1:49.3 for Illinois based trainer Jim Eaton. Tim Tetrick drove that afternoon in the Hambletonian at The Meadowlands and came back to Illinois that night to drive Cheyenne Hollywood, the Carey’s fourth place finisher. The $46,000 (Fox Valley Evita) 3-year–old trotting filly stake went to Mogo On The Gogogogo (Dave Magee), trained by John Butenschoen, in 1:58 flat. The $57,500 (Star Slinger) 2-year-old trotting filly stake was won by Little Bit Tuff (Dave Magee), from the barn of Bob Phillips in 2:00. The $58,000 (Plesac) 2-year-old colt trot turned out to be an easy 4 and 1/2 length victory for the Roger Welch Stable’s Maxter (Dave Magee) in 1:59.1. In the $51,500 (Gumcorner Lad) 3-year-old male trot the 6-1 longshot Thundercrack (Sam Widger), another Roger Welch trainee, take command at the half and go on to prevail in 1:59.1.
ooze Cruzin. The 8-1 longshot trained by Joe Seekman, won in 1:51 flat. 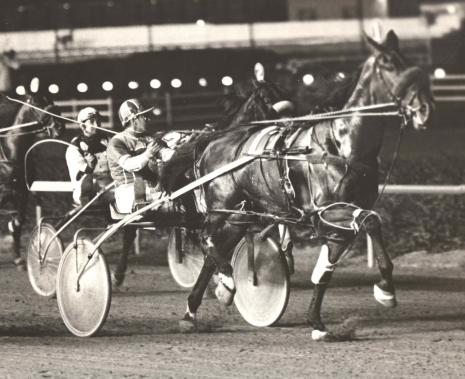 Later that year Booze Cruzin showed his heels to his foes in Maywood’s $220,000 Windy City Pace. The $59,000 (Determination Plus) was for 3-year-old filly pacers and there was no surprise there as Sportsfancy swept the series with Ryan Anderson for trainer Homer Hochstetler. Two months later Sportsfancy captured the $174,000 Grandma Ann Final on Balmoral’s 2007 Super Night. The $78,500 (Broadway Tax) freshman filly pace gave Dave Magee is fifth NOC winning horse when She’s So Hot won her fourth straight at Hawthorne for trainer Rick Schrock despite being parked-out the 56.4 first half. The $71,500 (Fox Valley Dynamic) for 2-year-old male pacers was the final race of the night and Omaha Survivor, catch driven by Tom Tetrick for trainer Tom Harmer, won by three-quarters of a length over King Of Kings with Mucho Sleazy third in the 1:52.1 mile. Hawthorne also had a trio of Late Closer Series that summer. The Australian bred Prime Xample A (Dave Magee), from the barn of Kim Roth, completed a sweep of the Sox series for fillies Kim Roth in the $33,600 Final while the 9-1 Kim Rinker trainer Skippers Tom Dog (Mark Saporito) eked out a win in the $35,500 Cubs series for colts and geldings. In the $25,000 Dunkster trot the pre-series favorite Before He Cheats, winner of 7 of his first 8 previous starts, came up lame and didn’t make the final as Just A Con Man, driven and trainer by Dan Shetler, romped in 1:56.1. The then 36-year-old Brent Holland was Hawthorne’s 2007 leading driver, his first title at a Chicago Circuit racetrack. ICF Star at The Big M: Illinois 2-year-old colt champion Meyer On Ice goes postward tonight (Friday) in a leg of the Kindergarten Classic at the Meadowlands for the Engle Stable of Buffalo Grove, Illinois. The Erv Miller trained freshman drew the second tier 11-slot in the ninth race and will be driven by Andy Miller. Meyer On Fire starts behind stablemate Century Ferrari (pp 1, Marcus Miller) and is listed as the 9-2 third betting choice. Driver Kyle Husted is back on the east coast with his stable of horses but not before he left town on a high note, bringing home three winners of Hawthorne’s Night of Champions. The slender 5-5, 150 pound Husted also enjoyed his most successful Chicago circuit meeting by finishing third in Hawthorne’s summer meet’s driver standings with 77 winning drives. 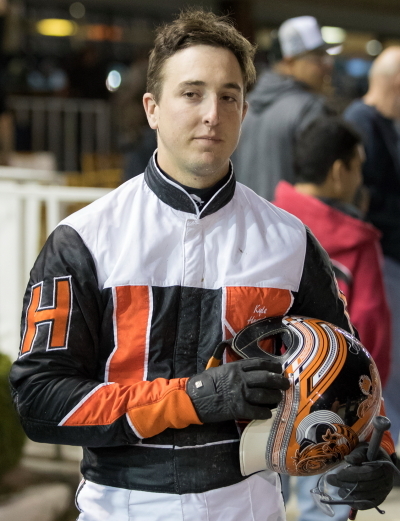 The 27-year-old Husted has steadily progressed as both a driver and trainer since joining the local driver colony on a regular basis in 2010. He went from 14 driving wins in 2010 to 108 in 2016 when he spent split his year between Hawthorne in the summer, and east coast tracks the rest of the time. Kyle Husted drove three winners on the Night of Champions. In 2017 horses Husted drove won over $1 million in purse money, a huge difference from his $272.513 total in 2011, his first full year of driving. Husted’s Hawthorne stats back him up. his summer he had a 15 per cent winning clip and over a 44 per cent success rate with favorites. The explanation point came on the Night of Champions when he won the Fox Valley Flan with the freshman filly trotter Louzotic, the Beulah Dygert 3-year-old filly trot with Trotting Grace (both Steve Searle trained fillies) and the Plum Peachy with the 3-year-old filly pacer The New Americana, conditioned by Harold Herrera. Kyle was second in another NOC final and third in two others, and was nosed-out of another third with He Gone Back in Molaro showdown. “Louzotic is a nice little filly, “said Kyle. “When I was driving against her early on I always thought she was the best in the division. Steve (trainer Searle) did a great job of having her ready for the bigger money races later in the summer. After Springfield I got an opportunity to drive Louzotic in her last three starts (all wins) and she showed me just how good she is. “I drove Trotting Grace all summer and she was good from the time Hawthorne started. She got sharper and sharper as the summer went on and pretty much dominated her division the last couple of months. Husted left Illinois with 79 winning drives in 2018 and more importantly with almost $850,000 in purse money won with three months of driving still left on the year. Husted picked-up his 500th career winning drive this summer at Hawthorne with his trotter Big Expense, currently competing at Philadelphia Park. Kyle also has driven this week at Pocono Downs, another eastern Pennsylvania track, as well as New York’s Yonkers Raceway. Illinois Gem in Indiana: ICF star pacer Fox Valley Gemini is competing (Friday) tonight at Hoosier Park in a $15,000 conditioned pace for 3-year-old colts and geldings. Regular driver Casey Leonard will be behind the recent Night of Champions Carey winner likely staying sharp for an upcoming open company stake event at the Indiana facility. Casey will also drive Trashytonguetalker, an eight-time victor this season at Hawthorne, in the $11,000 second race conditioned pace and the Ross Leonard Stable’s This Peach Rocks in the $18,000 tenth race for Indiana sire 2-year-old pacing fillies.